Nicki Minaj’s appreciation for U.K. culture goes way back. From day one, she’s dipped into an upper-crust London accent, and in 2011’s “Moment for Life” video, she unveiled a British fairy godmother alter ego, Martha Zolanski. But it’s clear that Nicki’s love for the U.K. runs even deeper. On November 5, she tweeted out rising British MC Ms Banks’s lyrics, “Yuh nuh affi ask when ya see me. See di house and cyar dat ah fimi. 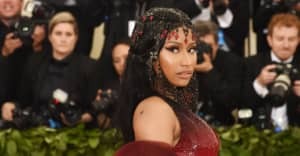 🏆.” They’re lifted from the south Londoner’s fun, dynamic verse on this summer’s femme-focused “Yu Zimme Rmx,” which also features Lisa Mercedez and the dancehall-inspired tune’s original creator, Stylo G. Understandably, Ms Banks lost it after seeing Nicki’s tweet, prompting a sweet exchange between the artists. They made plans to link up next year.